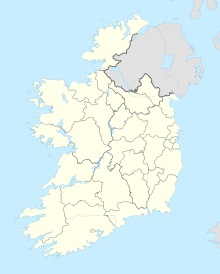 Waterford Airport (Irish: Aerfort Phort Láirge) (IATA: WAT, ICAO: EIWF) is located in Killowen, 4 NM (7.4 km; 4.6 mi) southeast of Waterford. It serves southeastern Ireland. The airport is operated by Waterford Regional Airport plc. Its single scheduled route, operated by VLM Airlines—which used Waterford as its only Irish airport and kept a base there—was discontinued from 13 June 2016, leaving the airport without any scheduled traffic. This occurred because VLM went out of business. The airport's development was initiated by Waterford Corporation, with support from the Government of Ireland and the private sector, in 1979–1980. The investment was £1.76 million. Waterford Airport opened in 1981, with a 1,200 by 29 m (3,937 by 95 ft) runway for single and twin-engine light aircraft and a portable cabin as the terminal building. The current terminal building was opened in 1992, and the runway was lengthened to 1,433 by 30 m (4,701 by 98 ft). Avair provided the first domestic passenger service in 1982, as a stop between Cork and Dublin Airport. In 1985, Ryanair launched the company's first international scheduled service from Waterford to London Gatwick. Waterford Airport celebrated 21 years of scheduled operations in 2006. On 13 March 2007, a €27.5 million upgrade of the airport was announced. Over the next two years the money would be spent on extending the runway to 7,300 feet (2,200 m) in length, building a new passenger terminal capable of handling one million passengers a year, and introducing scheduled flights to European cities such as Amsterdam, Barcelona, Paris, Prague and Rome. There was also an expectation of charter flights to Mediterranean holiday resorts. The expansion would mean that air travellers in the southeast of Ireland would have a "credible alternative" to Dublin and Cork airports, according to officials at Waterford Airport. According to the chief executive of Waterford Airport, Graham Doyle, the extended runway was to be in place by summer 2009 and capable of handling large jet aircraft, including the Airbus A320 and the Boeing 737. The fully upgraded and remodelled connecting regional road, R708, from Waterford city to the airport was completed in early July 2008, reducing the journey time from Waterford city centre to the airport to 10 minutes at off-peak times, and from the outer ring road, R470, to the airport to 5 minutes. Passenger numbers through Waterford Airport slumped in 2009, owing to the suspension of routes to Bordeaux, Faro, Málaga and Amsterdam, and to service reductions on routes to Birmingham, London Luton and Manchester. Overall passenger numbers from the UK fell by 9%. In February 2010, a Economic Impact Assessment of Waterford Airport was published, which highlighted the importance of the airport to the South East Region. Noel Dempsey, the Transport Minister, announced on 9 March 2010 that owing to difficulties with public finances there would be no funding for the runway extension at the airport, and that security and safety were priorities "in the current financial climate". On 12 August 2013, it was reported that a 150m extension of the runway would be funded by the Department of Transport up to a limit of €400,000. The airport itself would have to raise the remaining €850,000 for it to take place. VLM Airlines announced it would terminate its flights to London Luton at short notice by 13 June 2016, leaving Waterford Airport without any scheduled traffic. Waterford Airport has four check-in desks, an information desk, two boarding gates and two baggage carousels. The airport has two hundred car-parking spaces. Free WiFi is available within the airport terminal. There are two snack bars in the airport: one before security and one in the departures hall. There are also car rental services, a taxi service rank, First Aid, Baby/Parent Room, and Disabled Access/Facilities. As of March 2019, Waterford Airport had no scheduled commercial passenger flights. The airport is on the R708 road, which can be accessed from the R710 outer ring road in Waterford. Waterford has a by-pass, and thus the airport can be very easily reached from Dungarvan, Tipperary, Kilkenny, Carlow and Wexford. After reaching the outer ring road, three major primary routes can be accessed from Waterford: towards New Ross, Dublin and Cork. The nearest bus and coach station is 10 km away in Waterford, from where Bus Éireann provides services to Dublin, Cork, Limerick, Rosslare Europort, Wexford, Clonmel and Tramore. JJ Kavanagh and Sons offers connections to Dublin Airport, Carlow and Tramore as well. Dublin Coach provides a direct service to Dublin via Kilkenny, and to Cork via Dungarvan. There is also a railway station in Waterford; this offers services to Limerick via Clonmel and Tipperary, and to Dublin Heuston via Kilkenny and Carlow. On 8 July 1999, a Eurocopter AS365 Dauphin of the Irish Air Corps crashed into the sand dunes near Tramore at 00:40 am UTC +1 after returning from a sea-air rescue mission. The helicopter, Rescue 111, was destroyed by fire and all four crew were killed. The Air Accident Investigation Unit report blamed the lack of an air traffic controller in Waterford at the time; inadequate weather reports; faulty approach lighting to the airport runway; the fact that the Air Corps crew undertook the rescue mission even though they had never flown in similar conditions (and had already completed 15 hours flying that day); and an unnecessary delay at the rescue scene, caused by the use of an inadequate lifeboat although a fully equipped one was available. ^ a b EIWF – WATERFORD (PDF). AIP and charts from the Irish Aviation Authority. ^ "Aviation Statistics 2016". Central Statistics Office. 18 April 2017. Retrieved 18 April 2017. ^ "No funds for airport runway extension | Munster Express Online". Munster-express.ie. 12 March 2010. Retrieved 12 May 2014. ^ "Damning report on fatal Tramore helicopter crash". The Irish Independent. Retrieved 18 August 2017. This page was last edited on 21 March 2019, at 18:51 (UTC).